At the NRI meeting held in Canada’s Brampton on Sunday. NON-RESIDENT INDIANS (NRIs) have begun mobilising their community abroad to support leaders of the newly formed third front in Punjab. On Sunday, they organised a meeting at Canada’s Brampton to extend their support to the Punjab Democratic Alliance (PDA), an alliance of six parties including Punjabi Ekta Party (PEP), Lok Insaaf Party, BSP, RMPI, CPIM and Punjab Manch candidates. 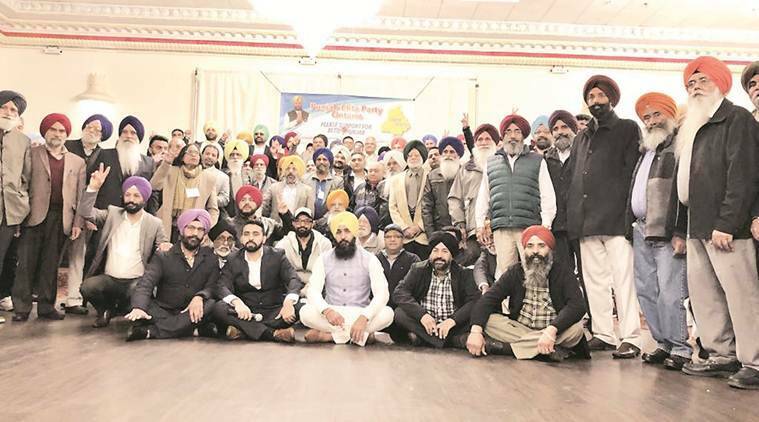 Speaking to The Indian Express from Toronto, NRI Kulbir Sandhu, who had supported AAP candidates in the 2017 Assembly elections, said that a meeting of around 300 members of the community from Toronto was organised on Sunday to urge them to support PDA members. Dalip Multani, another NRI from Toronto, said they had requested NRIs to support PEP candidate Bibi Paramjit Kaur Khalra from Khadur Sahib. “AAP rebel MP Dr Dharamvir Gandhi (Patiala) and Master Baldev Singh (Punjabi Ekta Party (PEP) candidate from Faridkot also connected with NRI supporters through video call and gave insight on their vision to make Punjab khushaal (prosperous) again,” said Surinder Mavi, who had mobilised large Punjabi NRIs under the ‘Chalo Punjab’ movement during the 2017 Assembly election in favour of AAP. “They requested for NRI support and supporters assured of their support to PEP in particular and PDA in general,” he added. “We still want a strong third front in Punjab, because of which we had supported AAP in last elections. But AAP’s Delhi leadership had no concern for the welfare of Punjab so we have decided to support PDA this time, which has fielded genuine leaders,” said Sandhu, adding that traditional Congress and SAD parties would bring no prosperity to the state as they are more interested in “filling their personal coffers”. He said that soon, they will be organising more such meets here ahead of the elections and go to India to canvass in favour of PDA candidates. Sources said more and more NRIs are being urged to fund PDA candidates’ election campaign.